Unfortunately, while you’re sound asleep every night, bed bugs are making their claim on the same mattress where you catch your zzz’s. Is there no way to stop the little buggers? Well, there is Bed Bug 911. Available here at Everything Summer Camp is the Hybrid Mattress Encasement as well as the Vinyl Mattress Cover from Bed Bug 911 . What is Bed Bug 911? They’re a leading manufacturer of products concerning bed bugs. But their services don’t end there. 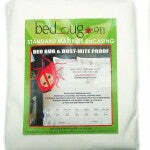 Bed Bug 911 also offers their services as bed bug exterminators. What they do is they offer everything you need (be it product or service) in order to get rid of your bed bugs forever! Founded in 2005, when New York began to panic over their epidemic of bed bugs. Before its existence, president of Bed Bug 911, Nicole Levine was the owner of a different company called Home Clean Home (HCH)—catchy name, huh? Well, this company was soon overwhelmed with customer requests for bed bug treatment. Customers of HCH—residential and commercial—were seeing bed bug infestation like no one had since the 1950’s. Nicole Levine was aware of the side effects people had to the chemicals and insecticides used for bed bug extermination, causing bad allergic reactions and, in some much more extreme cases, cancer and neurotoxicity. Nicole went straight to work developing an organic line of bed bug sprays and other means of preventing bed bug infestation. Three years ago, she was celebrated as the Businesswoman of the Year by the New Independent Democrats. She credits her company’s unprecedented success to the importance it places on customer service. We here at Everything Summer Camp are proud to offer products from Bed Bug 911 to make your kid’s summer safe and bed bug-free.